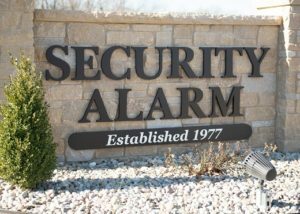 The Selmaville school district has been a long-time Security Alarm customer. Up until last year, they were utilizing dated security equipment. The systems were functional and achieved their original security goals; however, the technology was lacking newer, critical security features. Fortunately, one of our sales technicians recognized the need for an update and designed a system upgrade. 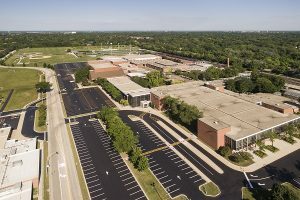 The newer security system created a safer environment for teachers, students, and staff, but also created a level of convenience that was previously lacking. 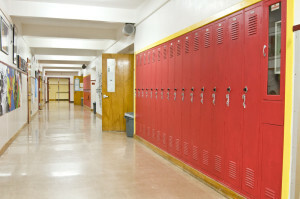 Security Alarm is one of the lead security providers for schools throughout Southern Illinois. Our team knows what security works best in schools as well as what the teachers, students, and staff require in terms of security features. Additionally, we listen and understand the concerns expressed from superintendents across the region regarding school security. This gives us a comprehensive outlook for designing and implementing the best-suited, most robust, updated security system for Selmaville School. Prior to the new system, this small, rural school was utilizing an older camera system that did not allow for clear facial recognition. Furthermore, the burglar alarm could only be disarmed manually on-site. To make managing security even more challenging, traditional keys were the only means of gaining access to the school. This created a myriad of challenges. If an alarm was set off, the superintendent would be notified by the monitoring company. Regardless of his location, he would have to physically go to the school to check the building. Often, he’d find the trip was due to a false alarm. If the police or perhaps a coach needed access to the building, the superintendent would receive a call and then travel to the school to grant access. If there was an incident caught on camera, the footage quality was rarely good enough to identify the individual(s). If there was an emergency, they picked up the phone and dialed 911. In the event a lockdown was necessary, they must go around to manually lock doors. If someone lost a key, they would have to rekey the entire building. These examples only begin to scratch the surface of the difficulty school staff and administrators had with the antiquated system. 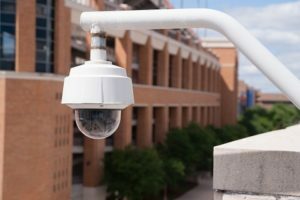 Securing the school was time-consuming, inconvenient and most importantly lacked the features that a modern-day school security system should contain. After numerous meetings with Selmaville school, our team gained a solid understanding of their specific security needs. With this information, Security Alarm was tasked with designing several new systems that when integrated together, created a robust mega security system. The new camera system covered virtually every square foot of the school — inside and out. It provided clear, crisp 24/7 video footage. The burglar alarm system was updated, offering administration complete control via smartphones and tablets from anywhere, at any time. To eliminate the use of keys, a new access control system was installed. Lastly, a panic button system enabled protection across the entire premises. Selmaville School was in control, feeling safe and secure with the new security system in place. When the burglar alarm trips, the Superintendent uses the smartphone app to access notifications. He has a precise view of what device was activated. This enables him to pull up cameras and see exactly who or what was going on without the need to travel. The access control system provides every teacher with building access using a key fob. When they enter the building by the proximity card reader, the burglar alarm is automatically turned off. This means they no longer have to remember their code, which in turn eliminates the majority of false alarms due to user error. If an employee loses a key fob, or if one falls into the wrong hands, it’s easy to deactivate that key fob from the software. If a person who doesn’t have a fob needs entrance to the school, they may call the superintendent for access. He pulls up the cameras via the smartphone app, sees what’s happening and decides whether or not to grant access. When a staff member is out on the track or baseball fields and there is an emergency, all they have to do is press their silent, wireless panic button. Once pressed, authorities are immediately dispatched. In the event a lockdown is necessary, securing the building is as easy as pulling up the app and hitting a button. At that point the entire school is locked down, allowing no one to enter or exit the school. It’s impossible to uncover all the ways Selmaville School has benefited from the new security system. School staff, teachers, and administrators have been nothing short of satisfied with the product, training, and ongoing support they’ve received from our team. 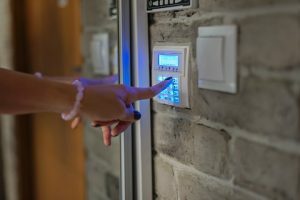 It is our hope that we can continue to serve this school district and countless others across Illinois by providing custom security systems that meet unique needs.